A few administrative notes before we start, yes? – We’re moving! Hosts, that is. I’ve had the WordPress.org business all purchased but not put together since, er, last November. I have to figure out what I’d like this corner of the Internet to look like, and it’s surprisingly hard. This will never be a capital-S, capital-B Serious Sewing Blog. I’m probably not going to monetize it at any point, and if I did, we’d have a roundtable discussion about it. I’m a total nerd for transparency and fairness, and you shouldn’t have to pay for this tripe, even if it does “just” mean clicking on an affiliate link or some such. Furthermore, it’s more a blog about talking about sewing than it is about the act of sewing (I run the Seinfeld of blogs, folks! ), so I have to take that into account. I just want to land on something that is clean and approachable, without being too polished or too twee. You’ll get a heads up when that happens. – I am essentially having a fabric garage sale on Etsy. Well, let’s not call it that. It’s a dual-purpose experiment. Purpose the first is to get rid of my some five bins of fabric. It was easier when all of my fabric lived in New York, and I had a big old bookcase to accommodate it. In my little, old, storage-challenged apartment? Not so much. (I have one drawer, reader. There is one drawer in my entire apartment. Isn’t that wild?) 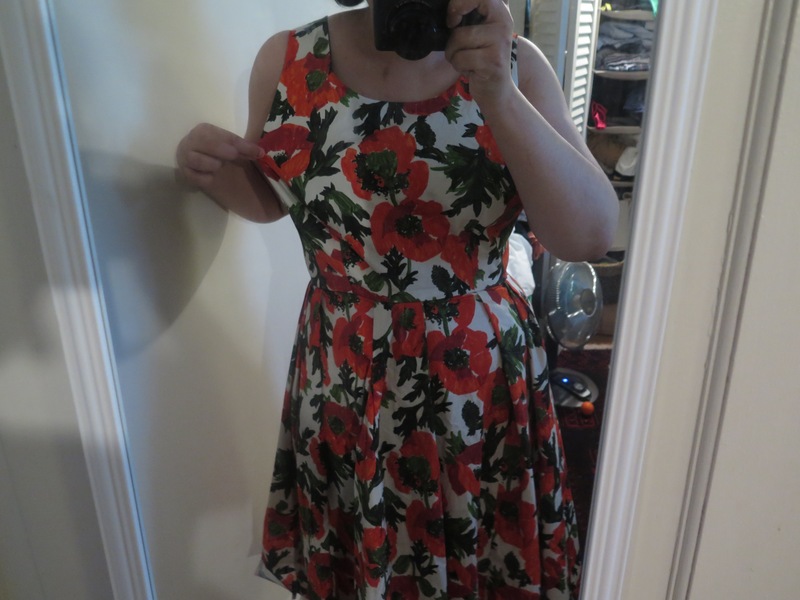 I’ve been sewing up a storm, but I have made an awkward peace with the fact that I do not look good in orange or brown, and I do not need six yards of just about anything. Purpose the second is to gauge how this sort of thing works. I constantly agonize over the future of the Garment District. I also want to find balance between going to school, doing research, working at a (more likely than not) unpaid internship, but also living a life that involves money that does not come from my family. So, you know, there. It’s tentatively called I Refuse to Iron This, because it is so much damn yardage, that I’ve neither the time nor the patience to iron it. Professionalism at its best. Anyway, this is it: Shop Seam Ripped. Buy something. Or don’t. Or just think about it. Or get disgusted and frustrated by the entire enterprise. Really, I run a very “Free to Be You and Me” sort of dictatorship. On to the actual post. Jeez, this is long. I should have broken it up, no? Anyway, we’re going to trudge through, almost there. I’m just learning how to do FBAs, and I’ve noticed this weird bagginess around the bust (but not directly at the apex and points latitudinal to it (I really need to find the proper geometric/sewing terms for this stuff when I finish this post—Catja, any opinions?) when I make them. I’m a 34DD, but I’ll make a muslin that should bring things up to my measurements, with or without adjustments. (I measure 40-30-41.5, with a 33″ high bust.) I’ve had oddly mixed results. M6696 is supposed to measure 42″ around the bust for a size 14 C/D cup, but I literally could not close the muslin at the bust. I brought the Emery and Simplicity 1873 up to a level that should accommodate a 40″ bust, and they were seriously baggy around the bust, everywhere but the point of greatest projection. I made the very same adjustment to the Robe Belladone, and it fit me like a glove. Ponder. Then I started thinking about the skirts I’ve made lately. I always just go by the waist measurement, but with each skirt I make, I could comfortably lop off an extra inch or so around the waist. Perhaps the answer is ease. The Emery is built with two inches of ease in mind, the 1873 has 3 (but I made a smaller FBA to bring it down to 2 around the bust). The Belladone? She doesn’t list finished garment measurements, but mine seems to measure 41″ across the bust, as a size 42 with a 1.25″ FBA. So that’s about .75″ of ease. Big difference, no? I thought my findings were rock-solid until I moved on to skirts, though. 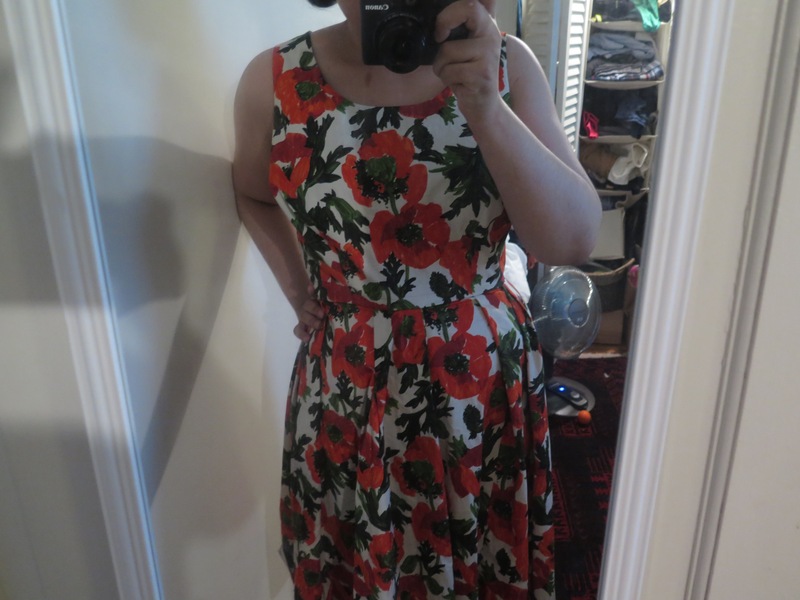 Zinnia is supposed to have only .5″ of waist ease, 1″ for me. Yet, I can easily pinch out a solid 2″ from the band. I suspect this might have to do with the infamous misalignment of the waistband and the skirt. 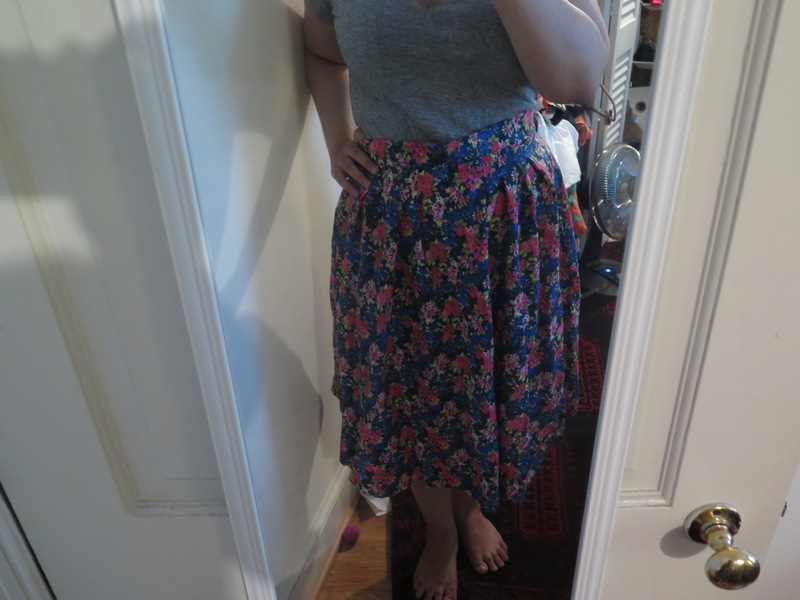 (The waistband is more than 2″ too short for the skirt, on the size 10, and I had to add a supplemental piece of cotton. Thrilling, as you can imagine.) Anyway, let’s get to some pictures. Behold! My Zinnia! 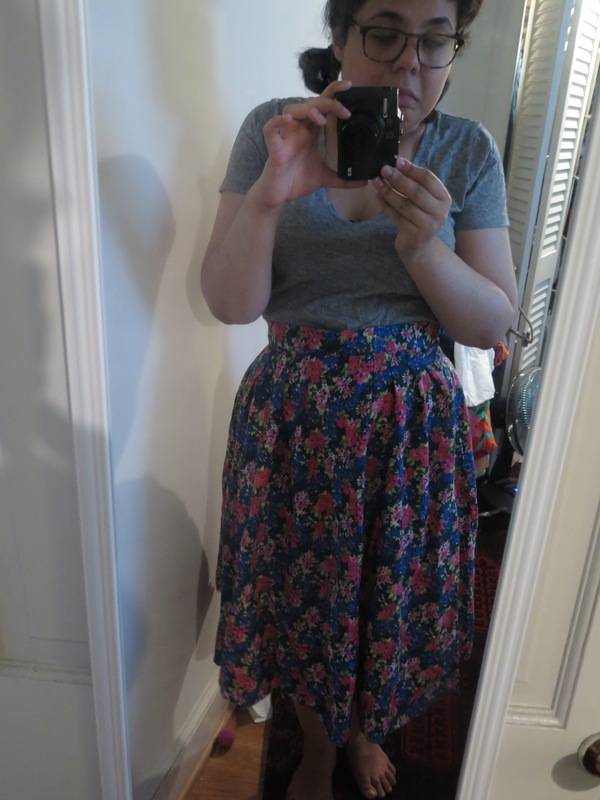 (I’m trying to exhibit the waist room without doing the whole Jenny Craig, clown-car trousers thing. “Look how many people I can fit into my old jeans.” Shut up.) This is version 2, in a size 10, with the length of version 3’s size 18. (Back story: I am having a bit of a midi moment, because Kiehl’s discontinued their Imperial Body Balm (as they do with everything I’ve ever loved), and my knees look like early-20th-century Fascist dictators. True story. I can’t decide if it looks like I’m wearing longer skirts because Christ has compelled me to, or if it seems like a conscious fashion decision.) Anyway, if you look in the middle, there’s a weird pucker out. If I look down through my waistband, I can see the floor. Hey, I didn’t say I was cleaning up the blog today, reader. This is a face I made, unprompted. To answer your question, I totally have a tripod, but look like a turtle when I use it. Not jacked like a Teenage Mutant Ninja Turtle, but like one of the slow-chewing oldsters at the zoo. Not cute. Not cute at all. In any event, until I figure out how I’d like my face to look there, you have to settle for cute pictures of me in the cheapest mirror at Target, with the view of my messy-because-the-cats-went-on-a-tear closet/bedroom. Only the best for you, reader. Where were we? Yes! Ease. Perhaps I am more comfortable with a smaller amount of ease than your average bear? That translates easily into skirts, but what about bodices? I’m unclear about the engineering, here. For instance, S1873 only gives the finished garment measurement for the bust. At a size 14, for which one is supposed to have a 36″ bust, the measurement is 39″. It’s built for a B cup, so I figured 36″ – 2″ = 34″ but three inches of ease seemed ridiculous, so why not corral it into 2? I made a compromise, and did a 1.5″ FBA. Does the excess ease mean that I have to take a smaller FBA? Should I assume that the ease is limited to the bust, or that is present throughout the garment? Should I cut a smaller size all together, and then work up from there? Do I decide on the smaller size and its accompanying FBA based on the formula Finished Garment Measurement = Body Measurement + 1, or do I go with the envelope back? When there aren’t finished garment measurements available, is tissue measurement the answer? Everything looks kosher at the bust, except for that weird side thing and then, bam! Here we have wrinkle city, a peek at my Anna, and the my cat-ravaged closet (it is one of my intersession break goals to tackle that monster). No, I am not sporting a baby bump, that is just a surfeit of fabric. Oy. The issue is, I don’t want to look like too much sausage stuffed into too little casing, if that makes any sense. I think I’m going to have to dive head first into Pattern Review and Artisan Square to see what everyone else does, and then cook up an answer that works for me. The weird solution was to take out two wedges from either side of the bodice, going from 1/8″ to 3/4″, for a total of 3″ taken off of either side. I think that might do the trick. I’ll show you the results after I press the bodice, and give the old girl a hem. 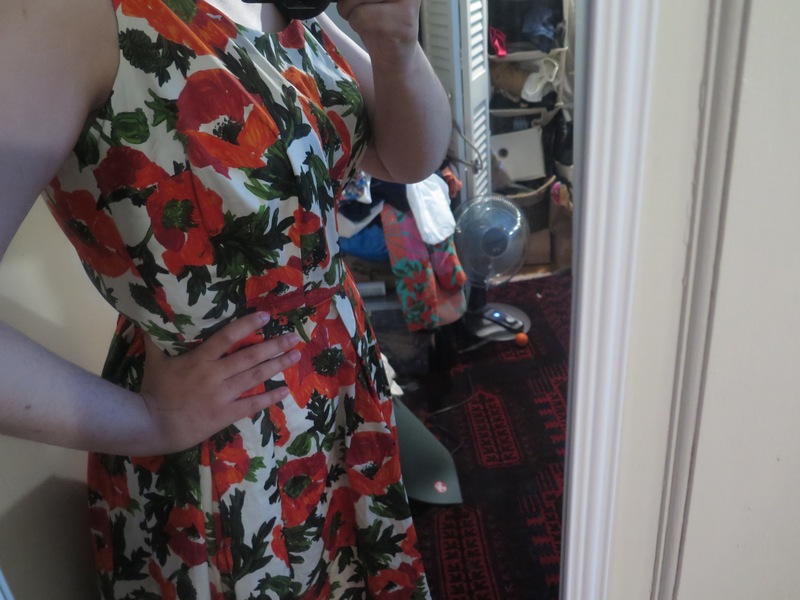 Plus, I have to figure out how to finish the waist seam, which always kills me. Overlock it? Stitch in the ditch? The options, they are endless. Who knows, maybe I’ll see you in another six months? How’re things on your end, reader? Not a rhetorical question, I’d actually like to know.